Periodically, I visit a number of Amazon lists to get a bead on both best selling and most wished for items. In the past I would look at lists related to outdoor recreation (which can be found in the second half of this article) but this time around I had some new choices. With mainstream interest in prepping and preparedness, Amazon has created a list of the Best Sellers in Emergency & Survival Kits as well as a related list for Most Wished For Emergency Items. 5 Thank You Giveaway for being a Backdoor Survival Subscriber! I was able to couple and cobble the “Best Sellers” and “Most Wished For” into a single list that would make any prepper proud. Using these lists, I have found a number of items that have made it into my personal kits. Below you will find the top ranking items from these lists. They are loosely listed in order of popularity and no surprise, I either own most of them or have them on my personal wish list. The LifeStraw is considered the most advanced, compact, ultra light personal water filter available. It contains no chemicals or iodinated resin, no batteries and no moving parts to break or wear out. It weighs only 2oz. making it perfect for the prepper. For more information, see my LifeStraw review. I was happy to see these show up in the top 10 again. These lightweight blankets are small enough to fit almost everywhere and have no weight to them. They are perfect for tucking into pockets as you head out the door. I keep some in my car and in my first aid kit. Another great stocking stuffer. Whether you even need to use it or not, everyone should have a quality fire starter in their kit. I have not used this particular unit (I use the Scout) but am impressed with the 2,800 positive reviews. Whichever fire starter you choose, take time to practice using it so you are familiar with the process. So here is the deal. The LifeStraw Family is a cinch to use and you don’t have to mess with filters. It is good for 4755 gallons and can be purchased for less than two Black Berkey filters. Gravity fed, the LifeStraw Family surpasses EPA standards for water purifiers and removes 99.99% viruses, 99.9999% bacteria and 99.9% protozoan cysts to 0.02 microns. For reliability and ease of use, LifeStraw is my number one choice. Read my review here. Next up is this emergency sleeping bag. Great review and value priced, this is one of the few items on the list I do not own yet. I have added one to my shopping cart, however, and will post a mini-review as soon as I can. Less than $10 for two paracord bracelets is a good deal. Even non-preppers will not balk at wearing one of these. Each bracelet compactly stores 12 feet of paracord, ready for deployment. I was recently asked whether I thought bulk food in buckets was preferred over freeze-dried meal pouches. For bulk foods such as beans, rice, oatmeal, wheat, pet food, etc. you will save a ton of money doing it yourself. On the other hand, it is good to have some freeze dried meal pouches in buckets ready to go for those times when the power is out and your ability to cook regular meals is limited. I personally have enough in freeze dried entrees to get by for five or six months. They are both in buckets and in #10 tins, mostly from Buy Emergency Foods and Mountain House. My two Mountain House favorites are Chili Mac and Beef Stroganoff. I promise that you will not be disappointed. This is the original Luci EMRG Solar lantern. I have put mine through its paces and it is one tough cookie. It has weathered both a wind storm and rain storm while hanging outdoors for a month. Lightweight, waterproof and shatterproof, Luci EMRG provides ultra-bright, reliable light to guide your way indoors and out, through blackouts or extreme weather conditions. This is the first time I have seen a wool blanket on the top 10 and I am happy to see it. I own a similar blanket I purchased at Emergency Essentials and am amazed a warm, yet light weight and compact, it is. I keep my wool blanket in the car at all times. It is 66 x 90. This is another one of those handy items that takes up very little room yet can be a godsend if you ever have to use it. It definitely will keep you sheltered from the rain but note it is not designed for long term survival use. Still, as a rain shelter it is perfect and packaged small enough to fit in a pack without taking up a lot of room. The following items did not make the top ten this time around but are perennial favorites of mine none the less. I admit to owning a number of these collapsible lanterns. They use 30 different LEDS and are powered by AA batteries, including rechargeables. Instead of a switch, you turn these lanterns on by extending the lantern from its collapsed condition. There are many different brands available but I have not found much difference between them. Shop by price. For more, choices, click here. This flashlight is amazing. It throws a strong beam that can also be adjusted by pulling out the head to create a smaller, more focused light. Because it requires just a single AA battery, it is lightweight and feels comfortable to use in spite of its small size. It even has a clip so you can clip it to a belt or inside a pocket. I am hooked on these Mini-Crees and own at least a dozen. Gaye’s Note: I own at least 6 of these and probably ten. I need to gather them up for a group shot for you. This makes a great clothesline! An ideal all-around utility cord in the field, paracord is tough and long lasting. It is made from 550-pound test nylon and features a seven-strand core for maximum strength. Also, it is manufactured in the United States. Note that some colors may be more expensive than others. Need ideas? See 44 Really Cool Uses of Paracord for Survival. This nicely built charger will charge charge AA, AAA, C, D, N, 9V, Ni-MH, Ni-CD, and Alkaline batteries. It has an LED display so that when you first put a battery in the charging bay, you know whether it is viable for charging or simply bad and ready to go back to the recycle box. Yes it really works, even under solar power. I am not kidding when I say I use this charger 2 or 3 times a week. 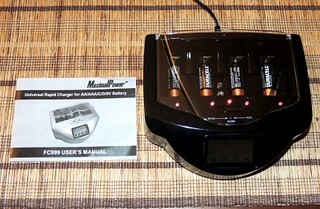 Read my review: How to Recharge Alkaline Batteries. Periodically, I visit both the Amazon list of the Most Wished For Outdoor Items and the list of Amazon Best Sellers in Outdoor Recreation to see what people are currently coveting. The most interesting thing about this exercise is that I am always finding useful items that are well priced at only five or ten dollars and often less. Below you will find the items that are currently part of these lists. They are loosely listed in order of popularity and no surprise, I either own most of them or have them on my personal wish list. 3-in-1 LED Vehicle Emergency Flashlight: New to the top 10, this appears to be a pretty fantastic flashlight (and you know how I cover flashlights!). Look at all of those LEDs. There are a total of 29 – 18 white and 11 red. 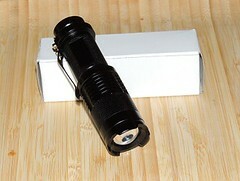 Powered by 3 AAA batteries, this flashlight is rated for over 100,000 hours. Ultra Bright LED Lantern – Collapsible: This is a new addition to the list. Oh my gosh. I want one. It uses 30 different LEDS and is powered by 3 AA batteries, including rechargeables. Instead of a switch, you turn it on by extending the lantern from its collapsed condition. With a lifetime warranty and over 1,350 close to perfect ratings, I can see why this is popular. Portable Windproof Waterproof Matches : I have purposely tried to drown these matches in sea water before using them. They light up every time! Less than $3 and shipping is free. Spork2go Spork Set, Four Sporks + Spork Carry Case: The most versatile outdoor eating utensil, the spoon-fork-knife combo makes eating–and cleaning up–on the go a breeze. This is a great price on a set of 4. I paid the same amount for just one. This would make a great stocking stuffer! Sawyer Products Mini Water Filtration System: Fans of the Sawyer water filtration systems are evangelistic in their praise. Did you know they only weight 2 ounces and fit in the palm of your hand? At $16. give or take the price is right. Be sure to also check out the Family Color Coded Gift Pack which looks nice. Tac Force TF-705BK Tactical Assisted Opening Folding Knife 4.5-Inch Closed: This is a newcomer to the list. It currently is ranked the #1 best seller in hunting knives. The reviews raved about this knife so I bought one and can recommend it. 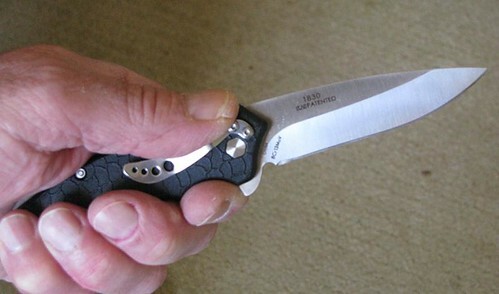 See my review: The Inexpensive Tac-Force Speedster Outdoor Knife. Nalgene Tritan Wide Mouth BPA-Free Water Bottle, 1-Quart : In the past year, I have purchased a number of Nalgene water bottles. These water bottles are BPA free and clean up nicely with a swish of vinegar. I also like the version with a narrow top – actually I prefer the narrow top version. I order mine in purple – just because. In addition to these items, I have some other bonus items all of which are personal favorites. Coleman MicroPacker Compact Battery Lantern: I absolutely love this little lantern! It folds down to nothing and the batteries last forever. I have yet to change them since I purchased the lantern two years ago. Kershaw OSO Sweet Pocket Knife: The sky is the limit when it comes to survival knives. For the beginner, or someone on a budget, a decent quality, all purpose knife is what you need until you have a chance to use it and learn what you like and don’t like, feature-wise, before you invest in something more pricey. Even then, perhaps the OSO Sweet will work out so well that it will become your #1 blade with no upgrade needed. How do Backdoor Survival readers prepare? I took a look at Amazon purchases over the last 3 months and clearly, we like to have basic items, not necessarily expensive, and lots of first aid and sick room supplies. Here is a list of the most popular items in no particular order. Amazon has made it easy for you by offering a free Kindle reading app for almost every device you can think of including all sorts of e-Book readers, tablets, smartphones and of course, a PC or laptop. Simply download the free Kindle app from the Amazon site and you are good to go. Thank You Giveaway for being a Backdoor Survival Subscriber! Periodically I also run Thank You Giveaways to thank you all who subscribe to Backdoor Survival Email updates. If you’d like to participate in the next one please sign up and stay tuned! I have been using your links to Amazon when you tell us about an item that I am interested in purchasing. Have a couple of questions though. (1) When I click on the link to Amazon and find an item and put it either on my wish list or my “save for later” list, when I go back to purchase it when I have the funds, do you still get credit? (2) Do you have a “generic” link to Amazon somewhere on the site that I can use to link to Amazon to purchase something I have found out about but is not on your site? PS: As a newbie I do ask a lot of questions. As I know you are quite busy with your blog posting I don’t mind waiting for a reply. That is why I subscribe to the posts I ask questions in. Prepping is a life long occupation and as a retiree I am in that “have more time than money” position, so use my time for reading, studying, and preparing. I am not 100% sure. The best thing is to go to my site, click on any Amazon link, then re-select the items. Kind of a pain in the neck but I do know that works. PS: Amazon right now has a daily deal for Swiss brand backpacks. Do you know how good they are? Thank you for all of your post. I find them very helpful. Thanks for the opportunity and many thanks for all you do! I feel just as you do… Lots of great information. Thanks for the subscriber love–back at cha! Thank you for an opportunity to win for subscribing. Appreciate your honesty about the products that you endorse. I have learned a lot by subscribing to your newsletter and perusing your website! BDS is one of the first sites we found and it continues to be a top favorite! Thank you for the time and information you share on so many topics and the encouragement that no matter where you are in this – it’s never too late or too hard to do something. Thank you, Gaye. Don’t often comment, but really enjoy. Keep up the great work. I find the information you provide very helpful. Already have my Emergency Essential order in. Some awesome deals this month! Wow thank you so much for all you do for us ???????? Thanks for a great give a way! Absolute top notch blog. Keep up the great work. Best prepper site on the web! Thanks for all your hard work and great info! I have learned so much from you. Thanks for everything you do for us. I just submitted an Emergency Essentials order. There were some very good buys on some items I didn’t already have in my emergency supplies. Thanks for the chance at the $25 Amazon gift card. well done – as always!! Your site is one of the greatest. Very good life saving information. Keep up the good work. Thank-you for your site and this opportunity! Thanks I’ve learned a lot here. Love your posts and site. Learning a lot! Sure could use that gift card! Wish I’d found your site when I first started prepping… would’ve saved me a ton of money. 🙂 Now I pass it on to everyone who shows an interest in prepping. Such a GREAT source of information, direction, and encouragement! Seriously… I pray God blesses you for all you do for us. Thanks for all the great information you offer and all the related research you do. The time and effort is greatly appreciated. Thanks. Love the free stuff idea. So many sites make you pay for information, not giving away much free. I would keep coming back even without the free stuff. You have so much information for us! You are appreciated. I like the fact that you are learning with the rest of us! I find many of your posts useful. Thank you for bringing such great topics and products to our attention, I always read your posts. I am overwhelmed by these comments! Honestly, I had no idea I would get to 500 entries so quickly. I was going to shut it down at 500 but plan to keep the giveaway open a bit longer so that everyone who received my email will have a chance to enter. A few minutes ago I ordered 4 $25 Amazon Gift cards so I will have them on hand. I will be repeating the giveaway again in coming weeks. You might be wondering why I am doing this. Mostly it is a thank you for continuing to visit my site but also, when times are tough is it nice to have a little extra “pin money” (does anyone use that term anymore?) for extra preps such as a flashlight or glow sticks, or some comfort items such as chocolate and coloring books. Whatever the winner decides to do with their prize is up to them. No strings attached. You guys are the best fans on the planet and are truly appreciated for more reasons then you can imagine. You’re so humble….but so true to yourself and others. You’re my fav. Thanks for all the depth-to-lightedheartedness articles…. You rock! Thank you so much for this blog. I really appreciate your common sense approach and the research that you put into the information you put out there. I so look forward to receiving each of your posts. Every one of them is informative. Thank you for your giveaways too. I really appreciate your good info and especially the articles on mental prep. The crazy events in our world seem to point out the need for better mind sets, more awareness while we work toward inner peace. Thanks. Thanks for all you do – you bring a much welcome matter-of-fact approach to sharing your information. It helps me feel that we are all in this learning thing together! I appreciate your emails and look forward to Monday mornings! Thank you very much for your wonderful giveaways! I really appreciate your helpful information you write about! I really love this site I have learned so much Please keep up the fantastic job!! WHO “DOESN’T” LOVE BACKYARD SURVIVAL? ANYTHING YOU COULD POSSIBLY NEED TO KNOW OR LEARN HOW TO DO USING BASIC SUPPLIES IS ALL RIGHT HERE. THANKS FOR ALL YOU DO! Thank you for this contest–I don’t always enter, but I love your writing and the many, many useful things I’ve learned from it. I hope you keep on going for a long time! If I were to win, I need stuff for a medical kit. Mine is very, very, very (and more veries) pitiful. It would go directly to that! Do not pass go, do not collect $200 (or whatever the amount is now!). Thanks for a chance! Thank you for all of the great content you pass along to us. I have a long wish list on Amazon, but I would love to get the regular mouth vacuum sealer for my Food Saver. Appreciate the opportunity to save a few bucks! I would probably use it for some Dr. Bonner’s Castile Soap and carrier oils. Thanks for another great giveaway. Have a wonderful weekend! Oh goodness, there are so many things I want & need. I would probably make myself crazy with indecision. Thank you so much for all you do. ~~~I hope we never really need all this wonderful survival advice. We shall be more apt to need it if that Hillary is elected. ~~~~I hope we never really need all your wonderful survival advice. We shall be more apt to need it if that terrible Hillary is elected. My wish list at Amazon keeps getting longer thanks to this site. HA! Gayle knows a zillion things that we all need and don’t have. This is a wonderful gift for anyone. Yes, awesome – and very generous! thank you for your very useful site. You give us a lot of good information to survive. Hope we never need it! God Bless you and all your readers! My weakest prep is in the medical area. I would use the prize toward a good Survival Medicine handbook. Thank you, I need to add to my medical kit, there are more items I think it should have. I just love your site & feel that if I’m looking for information, I come here first. Thanks for this! I would purchase supplies for making my own salves which is a skill on my bucket list for this coming year. My wish list is also growing I am planning on getting some of the portapotty buckets from Emergency Prep this month as they have them on sale for September. DH will have a cow but I am determined to be as ready as I can. Wow! You give us great ideas and information, set us up with discounts at wonderful retailers, and now even give away freebies. Knowing you’re out there figuring things out and coming up with ideas we need to consider helps daily. If I were a winner, having looked at some of the other ideas — and they’re all great, a multi-power source emergency radio would help a lot. I have relatives in Florida – when my mom, house-sitting on the beach, told me about seeing white caps in the water OF THE POOL, I got nervous and I’m in Arizona! We’re laying claim to our usual monsoons and amazing walls of dust this year, but having no communication source leaves me out of the loop if the power goes down and knowing what’s going on keeps my inner control freak happy. If I win, it will go toward something on my Amazon ‘survival’ wish list. WOW! Thanks for the chance to win a gift card…Back Door Survival is the BEST! Thank you for sharing your knowlwdge of essential oils & making salves! I made your DIY Miracle Salve a few weeks ago & both my mother & I are hooked! Having to use it to rub her knees & legs before bedtime has given us an opportunity to chat more about how our day was…Miracle Salve is also a relationship healer. Again, thank you! Thank you for the great giveaway! Well, they are all pretty fantastic. I have a canner rack sitting on my wish list, so that is what I would get if I won it. I have learned so much from you and your site. Your promotions and discounts mean so much for those of us who are trying to stretch our dollars. Amazon is my number 1 place to shop and learn about products. Every time I visit your site I find something new I want to get. I love gift cards and this would be great t win. I have learned a great deal from Gaye and her blog. I would love to have some books from AMAZON. Thank you for all that you do to keep us up to date. Thank you for offering such a nice raffle. Love your site. I don’t always enter but I do love the articles, thanks for the chance to save a few bucks on my wish list. I would use the gift card amount towards a food dehydrator. I would love to win as I have several things on my wish list. Thank you. Thank you for the generous offer. Less than 6 hours ago, I was shopping survival preparedness on Amazon! I hope we never have to put any of the to use. I’m a newbie so I feel I need everything, even tho I’ve been stocking food and ordinary things like med supplies, Mt House no. 10 cans, energy bars, etc. An amazon card would be put to good use! Thanks for the giveaway, Gaye! If I won, I’d put the funds toward a battery-operated emergency radio. Really enjoy your articles. Where do you find the time? I love this site! I have learned so very much this year!! IT’S GREAT DOING THOSE GIVEAWAYS. THAT CHEER UP THE BACK DOOR SURVIVAL. I first came across your website two years ago, read “20 Items to Kick Start Your Food Storage Plan,” and started buying the suggested items over a period of several weeks. Reading other articles on this site led me to start stockpiling water, vitamins, and personal-care items; I also took on a second part-time job to add to my emergency savings account. Unfortunately, I lost my full-time job several months ago with no warning and am still job-hunting, but I’m not worried about it. This experience is so much less stressful with a fully stocked fridge, freezer, and pantry, the aforementioned other supplies, and plenty of cash in the bank. No one knows that I prep…which means that no one can figure out why I’m so calm. Thank you, Gaye, and good luck with your upcoming move! I appreciate the information you provide on your website. Thank you for offering the Amazon gift card. Most likely I will get “The Survival Medicine Handbook: THE essential guide for when medical help is NOT on the way” (third edition) by Joseph Alton MD and Amy Alton ARNP. THOSE OF US WHO ARE OF THE OLDER GENERATION; WIFE AND I WILL BE 80 YEARS OF AGE NEXT YEAR, 2017, IF WE SURVIVE STROKES AND HEART ATTACKS, PROBABLY APPRECIATE ESPECIALLY THE EFFORTS OF FOLKS LIKE YOU AND YOUR ORGANIZATIONS; WE WHO WERE BORN IN THE LATE 1930s AND GREW UP POOR IN THE 1940s & ’50s. SO, THANK YOU FOR OUR FINE EFFORTS. all else is highly suspect. This isone of the few sites that I go to at least once a day. don’t apologize for your rants–i enjoy them! Thank you so much Gaye, for all you have done for us these past years. Have learned so much from a website that I know to be honest and only giving us much real information that has been thoroughly researched before putting online. I hope you continue to send us the information we greatly need. From a big fan. Thank you Gaye. Thus us the number one site I come to for survival information. It us so diverse, that I am continually learning. Thanks, Gaye. I always appreciate the information you share. Thank you for your posts and contests! I’m a newer subscriber and so far enjoying your website very much. Thank you! I love the information, I have used a lot of the info that i have learned and I share you with a lot of people so they are aware of you and your skills as well. Thank you so much! please keep teaching us ! Having a little panic attack here. If Backdoor Survival is leaving WA, should I also??? LOL Thanks for the giveaway opportunity! I and always read your site and print some for my own folder. Thanks for all you do. Thank you for creating and posting this site. Thank you, Gaye. We appreciate your efforts. Gaye, Thank you!! I really enjoy learning from the variety of articles you post. Yes, leaving Washington & the Pacific Northwest will be bittersweet. I fell in LOVE with ‘your’ state when I moved there after spending my whole life in Mississippi (well, I did live in Louisiana for 7 months once). I’d never seen such beauty, and GREEN everywhere. I asked my soon-to-be husband why he’d chosen Washington after he’d done his military duty & being based there at one time, and the first thing he said was “The GREEN”. What are called ‘hills’ there are mountains here in Ms.
We were forced to leave after the rental property (258 acres of hills, woods, isolation) was leased out from under us (30 days notice) at the worst time of the year. You might have read about the people who leased it, Gaye, in Elbe by some crazy group.. Yeah, THAT was why we had to move off our hilltop. Money talks, don’t it?! BUT since not having the money to buy or rent somewhere else, we moved back to my home state. I’d kept MY mortage-free home after flipflopping whether to sell during the 2 1/2 yrs I was up there. Family here/none there for either one of us, was the deciding factor in keeping my home. My youngest son & family had bought in my hometown during my absence; ALL of my family is within 40 miles. The only thing we don’t like, and was talking about it just yesterday, is that it’s smack dab in the middle of town. We can walk to our church, PO, and the stores though. Neverthe less, we’re concerned with living too close to neighbors, many many of whom I don’t even know. We stay completely tightlipped about our preps, and are the definition of ‘the gray man’. Sooo, we have a bug out plan in the works. Needless to say, we’ll head toward the mountains even though it probably won’t be in Washington; too close to the coast and huge militry bases to worry about. But, I sure do miss Washington and her people!!! I’d never met a nicer bunch of folks than there. Thank you, Gaye, for being so sweet this month in offering the giveaways. It’s NOT the reason I follow you though. STILL looking forward to ‘traveling/moving’ with you & Shelly. Can’t believe you are moving!!! Thank you Gaye, for everything that you do, all the information that you provide. It is very much appreciated. Thanks for all the valunale information you provide. Just a word about the Mountain House Beef Stroganoff. I have been putting 1/2 to 1/3 cup of instant mashed potatoes and extra water with a 1 cup serving. Makes a heartier meal. A little salt and pepper or even hot sauce for extra flavor. Other meals could be beefed up the same way. Being that the stroganoff is one of their cheaper meals this makes it even more of a bargain.